For this DIY round, we'll be showing you how to create stunning modern art for less than $20! We have created dozens of backdrops based off of this premise and this look just never goes out of style! Base paint we used white, this color will be used the most as you'll need it in order to cover your entire canvas with multiple coats. Accent paint(s) we used black, this secondary color will be used the next most often, with smears, splats, and harsh brush strokes appearing all around your canvas. Foil + Adhesivewe used gold, this will be used to bring life to your accent paints. Brushes you'll need one for your base paint, one for your accent paint, and one for your adhesive. Now that you have all of your necessary materials, you can't forget the smart materials- like a well covered area workplace! Always remember to use gloves if your hands are sensitive to paints or adhesives, and of course always cover your workspace! Step 1: Set yourself up for success! Take your canvas and place it face up on your covered area. Using a wide brush, paint the canvas white. You'll most likely want to do a few coats in order to get full coverage, but depending on the thickness of your paint and the color of your canvas, you may only need one. Make sure to allow ample time to dry in between coats to prevent unnecessary smearing! Step 2: The really fun part! Go ahead and let your inner Jackson Pollock go wild! We generally will begin from the outer edges of the canvas and work our way in with larger, smudgy, and wide accents and have some other more sparing accents in the middle. Play with textures here! Step 3: The Wow Factor! 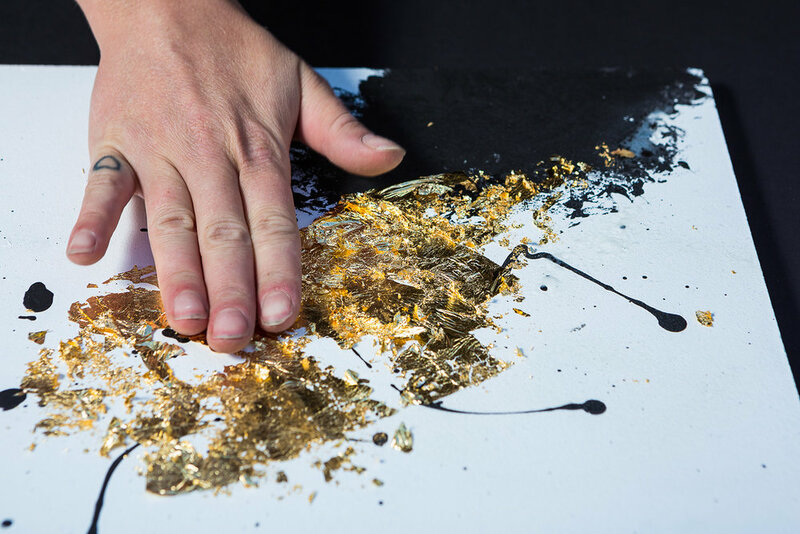 Gold foil definitely takes some getting used to, so we recommend doing a little experimenting before you begin applying it directly to your canvas. It's simple enough- just apply your adhesive in the general pattern you would want the foil to be seen in, then take your foil (and rip it into pieces you like), and then apply with your hands. Pro tip: smaller pieces are easier to work with and it's much easier to make your goal foil art larger than it is to reduce the size. Step 4: Step back and admire your work! Allow ample time for drying (which will vary depending on the amount of paint used). Then mount and hang your art and wait for all of those compliments to come rolling in! Happy crafting from the SY&Co. team!